In my household, men and leftovers don't mix. Last week I made a tray of lasagna and with only three of us, this means leftover galore. I served it again the following day, and then another day, and my husband looked at me like "Ahhh... are you kidding me? ", with my son also looking a bit puzzled. "Oops sorry, I forgot about the unwritten rule..." I minced. So the other day, I made a ton of spaghetti sauce, and with potatoes being on sale, made lots of mashed potatoes the next day. And yes you're right, today we had left overs. But for a wife like me (and I'm sure just like most of you) I operate my kitchen expense with a strict budget... so these left-overs must be used in a productive/creative way. Now the recipe I'm going to share with you today is what I call "leftover surprise". It's one of those dishes that I whip up so that the men in my household will not suspect (or even care) that it was made from leftovers, haha! 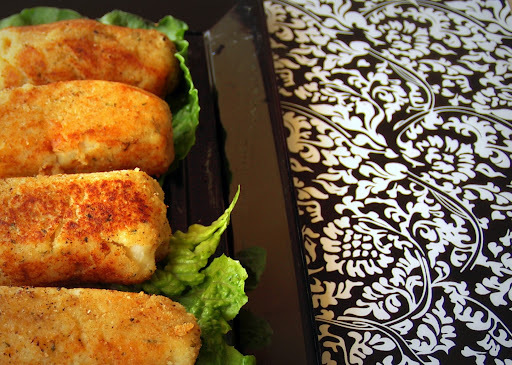 So here it goes, my version of stuffed croquetas or meat-filled potato croquettes. Mash the potatoes. Add butter and continue to mash until potatoes are smooth. Add the egg and mix it thoroughly. Add in the milk and 2 tbsp of bread crumbs (or until potato mixture is not too mushy). Season with salt and pepper to taste. Roll to an oval shape and flatten between the palms of your hands. Add a spoonful of the spaghetti sauce (you could use any left over ground beef dish like picadillo). Seal the top and the sides with more mash potatoes; using your palm re-shape the mashed potatoes just as like the photo.. In a skillet, add 2-3 tbsp of oil. 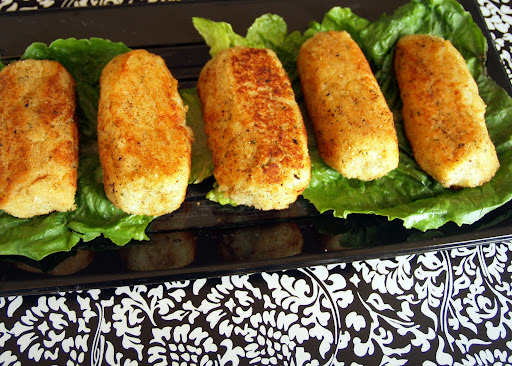 Pan fry each side of the croquettes until nice and brown. Your family won't suspect that it's a left-over surprise... ***wink ***wink! no you're not weird. I love leftovers do. I don't find it eewwie or anything. Great to see you! Hi Malou, it's not only in your home that men and leftovers don't mix. I believe that's true in the homes of many. The dilemma for us who cook is--- most often we just couldn't keep the volume enough for a meal or two. Especially when we couldn't get a small bunch of veggies and other goods from the groceries, we really are left with not much choice but to cook them all :( Well, I guess you hit me right through, thanks for that. I should practice the art of creatively handling leftovers from this time on. i don't like throwing food, I see $$$ going to the bin haha. but true right? Yeah we should have the ability to create dishes out of leftovers. im glad that i could help. how was it? My kids will love this! 2 of their most fave ingredients in one! Gotta try this when I get back! are you still on vacay.. wow sarap. where are you guys? What a great idea for leftovers! 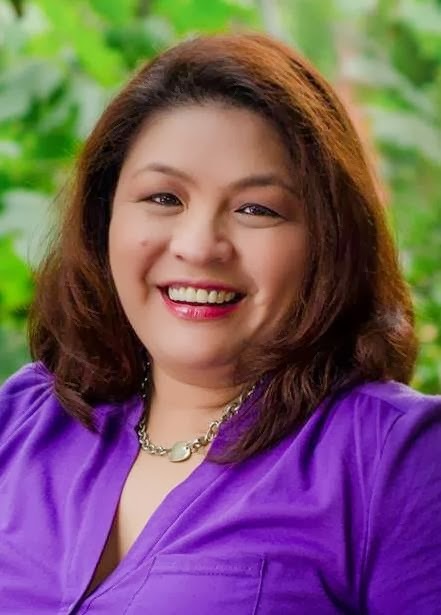 You are such a creative culinary expert, Malou! Thanks for sharing! Happy Mon.! Malou, bless your heart, you are just like me in the 'leftover department'...I even bug my daughter about her leftovers to make sure to give to me, so I can re-create another dish, such as 'pasta frittata' which is leftover thin spaghetti with homemade fresh tomato chunky sauce. Just saute onion, garlic,your choice of leftover veggies, or fresh, crack an egg or two to scramble, sprinkle with your fave cheesw (ie mozzarella) and bake in the oven to crisp it! 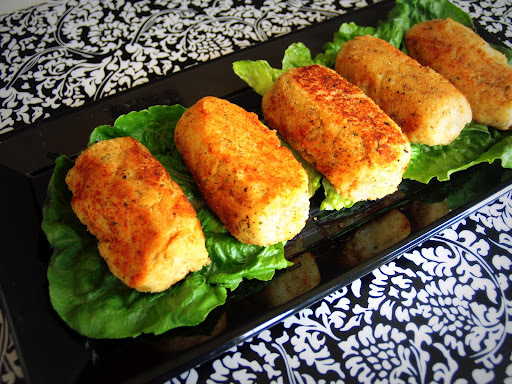 Your croquettes are way more attractive than mine are, love the perfect little log shapes and the creative meat filling left over from the sauce. The photos are amazing, as well! You are truly enterprising and prudent. Thanks Malou for all your post, I have tried and tested it and I can only say tha" They are superb!" Have a blessed Birthday! You are one of Gods wondrous blessing to me. Happy Birthday!